AWESOME AGAIN has forged his place among the elite sires. 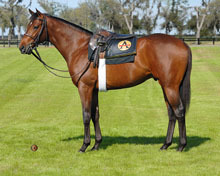 He has sired nine U. S Grade I winners, eight from his first four crops. 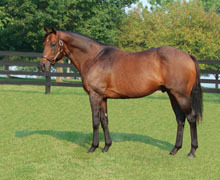 He is the only Breeders’ Cup winner to sire four Breeders’ Cup winners, and the only Breeders’ Cup Classic winner to sire a Breeders’ Cup Classic winner. Seventeen of Awesome Again’s 27 stakes winners (63%) are Graded winners. 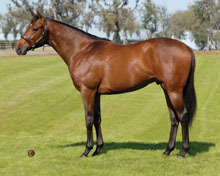 Broodmare of the Year BABY ZIP is already the dam of two Grade I winners: Horse of the Year and Champion Older Male Ghostzapper - stakes record-holder for the Breeders’ Cup Classic and full brother to this two-year-old; and eight-time stakes winner City Zip - winner of Saratoga’s prestigious Hopeful S.-G1 at two. Ghostzapper is one of the most exciting stallion prospects in years while City Zip was his crop’s leading freshman sire of winners.